Hepsia's Email Manager is an all-in-one email management tool, which will give you absolute command over your e-mailboxes and electronic mailing lists. 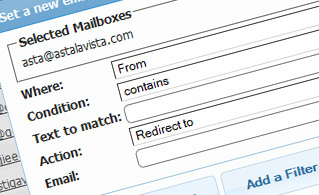 With this easy-to-navigate interface, you can set up a new e-mailbox in an instant and manage its settings effortlessly. Additionally, you can forward mails from one email box account to another, create e-mail filters, set up auto-reply messages and secure your email box accounts against unsolicited bulk e-mails. We have a server-side anti-spam filtering solution, so you can defend all your email boxes against unsolicited bulk e-mails. 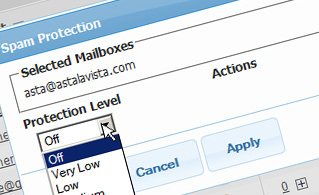 You can also change the anti-spam protection level from 'Very Low' to 'Very High' to ensure that no unwelcome mail messages will find their way into your e-mailbox. Your e-mails will be sifted out on the basis of their spam score. You can also decide whether a mail message marked as spam should be erased or forwarded to a certain email mailbox account. Email filters are perfect for filtrating your incoming mails according to specific criteria specified by you. Setting up e-mail filters is extremely easy - all you need to do is fill out a simple form and your e-mail filter will be created and will go into effect instantaneously. You can swiftly create an email filter for any of your e-mail box accounts and select the mail filtering criteria according to your desire. You can easily forward your incoming emails from one email mailbox account to another, or even to a number of other e-mailboxes. Simply specify the email box you want to redirect emails from, then choose the target e-mailbox and indicate if you want to keep a copy on our servers. With the Email Manager graphical user interface, you can quickly set up the e-mail client of your liking to access your e-mailbox accounts. Simply browse to the Auto-Config column next to the mail account you wish to set up on your desktop computer or cellular phone and click on the e-mail client that you want to use (Microsoft Outlook, Outlook Express, Mozilla Thunderbird or Apple Mail). Then a file will be created for you. 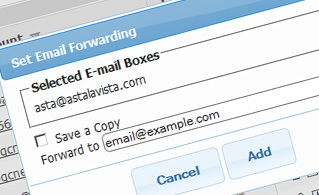 Drag the file to your e-mail client and the new email mailbox account will be configured in a minute. With the Email Manager interface, managing multiple email boxes at the same time is a piece of cake. The Email Manager GUI will also allow you to easily set up an auto-response message - specify the message you would like people to see and our system will do everything else. 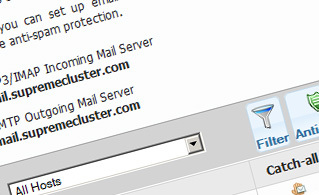 And if you want to set up a catch-all e-mail box - you can achieve that with a simple click on the Catch-all icon.